Prostaglandin F2 α (PGF2α) is produced in various tissues, it contracts smooth muscle and has been used to induce labor. It also has a luteolytic effect and has been considered a luteolytic hormone. Usually, urine and tissue culture supernatant can be assayed directly following dilution with EIA buffer. PGF2α can be extracted from plasma using Sep-Pak columns according to the protocol provided. 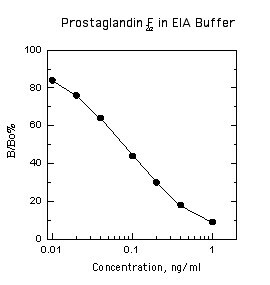 This is an ELISA for the quantitative analysis of PGF2α levels in biological fluid. This test kit operates on the basis of competition between the enzyme conjugate and the PGF2α in the sample for a limited number of binding sites on the antibody coated plate. The sample or standard solution is first added to the microplate. Next, the diluted enzyme conjugate is added and the mixture is shaken and incubated at room temperature for one hour. During the incubation, competition for binding sites is taking place. The plate is then washed removing all the unbound material. The bound enzyme conjugate is detected by the addition of substrate which generates an optimal color after 30 minutes. Quantitative test results may be obtained by measuring and comparing the absorbance reading of the wells of the samples against the standards with a microplate reader at 450nm or 650nm. The extent of color development is inversely proportional to the amount of PGF2α in the sample or standard. For example, the absence of PGF2α in the sample will result in a bright blue color, whereas the presence of PGF2α will result in decreased or no color development. in conjunction with your samples since urinary creatinine levels may be used to normalize the rate of excretion of other analytes.